I love these as a little gift for neighbors, teachers or anyone who you want to share a lovely treat during the holidays with. They package beautifully and ship perfectly. Preheat the oven to 350 degrees. Line your baking sheet with a Silpat or parchment paper. In a large mixing bowl combine the flour, cocoa, soda and salt. Whisk to combine. In your stand mixer, paddle attachment on, blend the sugar and butter for 2-3 minutes. Then add the eggs. Blend. And finally the extract. Add the dry ingredients to the wet and blend. This is a very firm dough. Once combined, add the chocolate chips and mix by hand or with the mixer. Separate the dough into two equal halves. Then form a long log like shape that you flatten a bit. It should measure about 12 or so inches long. I like to make these smaller biscotti because they are very decadent with the chocolate coating. Then repeat. Place both logs onto your baking sheet and bake for 34-36 minutes or until firm. Remove and let cool for 10 minutes. Then place on a cutting board and with a serrated knife, slice 1/2 thick pieces on a diagonal. Place them back on the baking sheet and return to the oven for 12 minutes or until toasted nicely. Melt your chocolate over a double boiler or in the microwave, keeping a watchful eye so it doesn’t burn. Add the oil and mix until creamy and smooth. 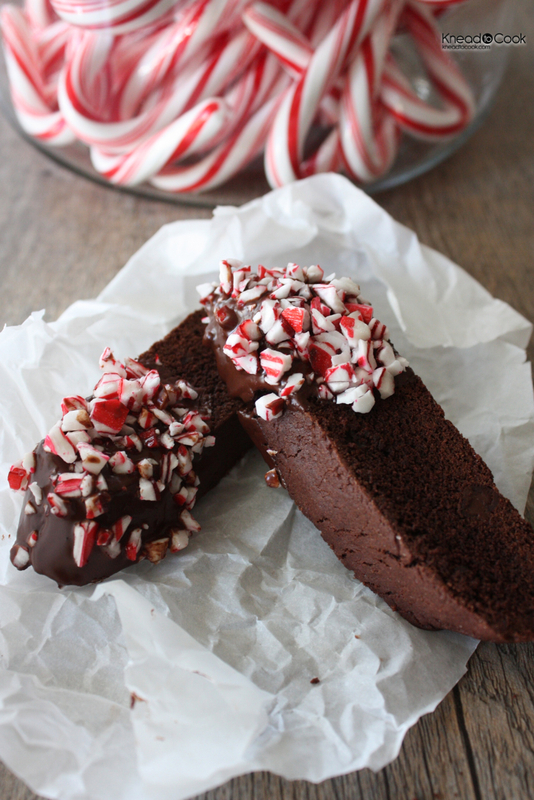 Add the peppermint pieces to a bowl and set aside. Once the biscotti are done toasting. Dip one end of your cookie into the chocolate. Let the excess drip off. Then sprinkle some peppermint pieces over the melted chocolate. Place on a drying rack to set up. Once the chocolate has firmed up, store in a tupperware container with a lid for up to 4-5 days. Enjoy! Can these freeze or would the crushed candy become gooey? I’m sorry for my delay in writing. I haven’t frozen and would suspect the same thing.